Classroom and office facility is located in the Woodstock Commons Shopping Center immediately beside the Goodwill Store at the north-east intersection of Highway 92 and I-575. From Atlanta: travel north on I-75 to I-575, take exit 7 (Hwy 92 Woodstock). Make a right off exit ramp on Hwy 92. Woodstock Commons Shopping Center shall be on your left. Make a left at first traffic light and then a U-turn, or a left into the shopping center. Classroom is immediately on right of Goodwill store. Approximately 15 mins north of I-285/I-75 interchange. Public transportation is now available from Atlanta to Woodstock. For further information please visit GRTA Xpress. Route drops off approximately 1/2 mile from the classroom. From NorthWest Geogia: travel south on I-75, take exit 277 (SR Hwy 92 Alabama Rd). Make a left off exit ramp on Hwy 92. Travel approx 8 miles and cross over I-575. Woodstock Commons Shopping Center shall be on your left. Make a left at first traffic light and then a U-turn, or a left into the shopping center. Classroom is immediately on right of Goodwill store. 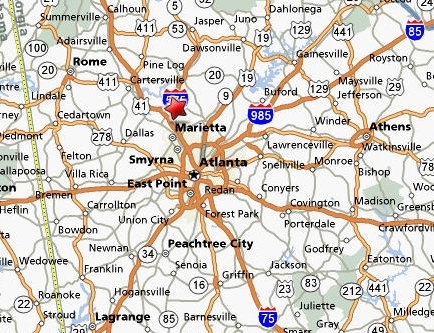 Acworth Location - office facility - courses are NOT conducted at this location. AREA can bring classes to your appraisal/real estate office. Let us know where you are and what are your education needs. Contact office at - education@area-ga.com or 770-591-5552.